Bill's Blog: Sods Law - Twice in one week! Sods Law - Twice in one week! Last Saturday 'Chips Away' gave my car a complete exterior overhaul. I save dents, scratches, and major scrapes till I have about four, before calling in the experts. So I was delighted when my car looked as good as new after the valeting. Then on the way back from my sculpture class on Tuesday afternoon I parked in the Waitrose car park keeping it well away from the four by four in the next bay. So you can imagine how upset I was when I realised my car had been scraped down the rear door and back panel! Sods Law. And after weeks of hot sunshine, today it rained all day! 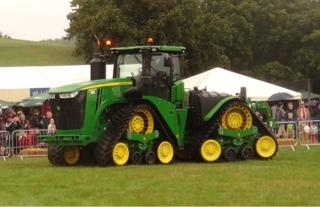 To coincide with the annual Henley Agricuktural Show! We knew it was forecast to be a rainy day, so, not to be disappointed my young friend decided to order a small gazebo. Thanks to Amazon Prime it arrived at 5.45pm yesterday - just in time. After a practice erection first thing Saturday morning we were ready for the show. We picked up Debbie and Val on the way. 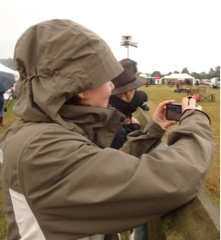 Several envious looks came our way as the two by two metre gazebo formed a perfect shelter in front of the the car parked by the ringside. 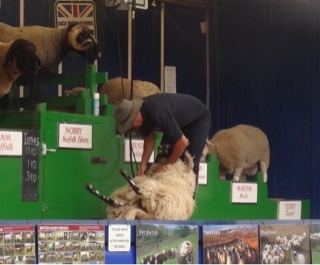 The first thing we saw was a very articulate bloke sowing the audience how to shear a sheep. 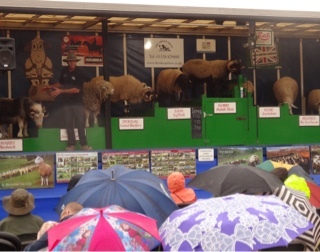 You can see by the umbrellas that the rain didn't deter the audience's enjoyment. At the end of his performance he managed to get all the sheep to dance too. 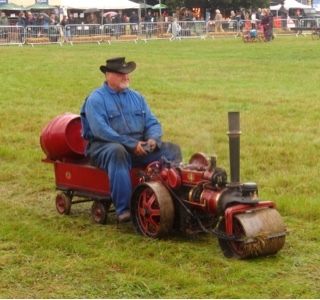 This year, being the 125th anniversary of the show there was a display of 125 tractors, ranging from the modest 'Fergie' to this incredible machine costing several hundreds of thousands of pounds. 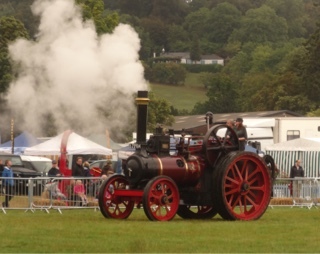 Then there was a parade of steam engines. Here are a few of them. 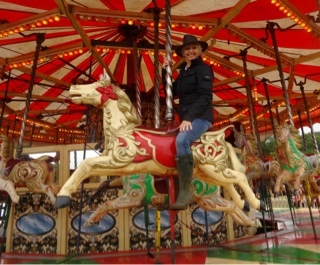 Debbie and my young friend then decided to have a ride on the carousel. Here's Debbie. 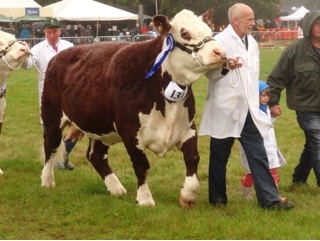 No agricultural show is complete without a parade of prize animals. Even though it rained all day we were snug in my young friend's gazebo as we enjoyed our picnic. 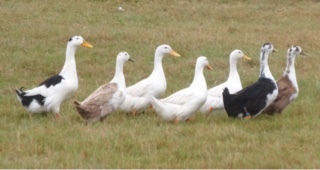 And here she is covered up against st the rain, watching the duck herding event. We had an interesting time on Friday. An American lady - Bobbie Nash - who had bought one of my miniature portraits at this year's Florida show, was visiting England with her two sisters and a friend. 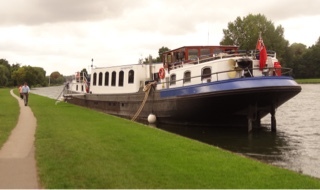 The had hired the luxury barge 'Magna Carta' for six days for a cruise on the Thames. And as they were due to moor overnight in Henley on Friday we were able to meet up. I live in Remenham so it was easy for me to park by Remenham church which is only a short walk from the river. I'd arranged to take the ladies to lunch at Phyllis Court so picked them up at noon at the mooring in Remenham. This is the Magna Carta. The owner and Captain, Dominic Read, had originally bought the boat in Holland but when it reached England because of its length it wouldn't be able to fit in many of the locks on the Thames. So what did he do? He arranged for a boat builder to slice a section out of the middle and rejoin the ends to make it shorter. Quite an undertaking. The boat is now 120 feet long. Still a very large boat. After lunch on the verandah at the club the ladies came back to my flat to have a look at my paintings. My young friend and I were invited to dinner at the Captain's table that evening. The interior was pretty lavish - a really comfortable set of leather sofas and a dining table to seat ten. We also saw one of the four staterooms - each with a double bed and bathroom. Two of the crew members served our meal which was really lovely. I played my first game for Henley Bowling Club last Thursday. We played Maidenhead Town. Also it was my first away game so was interesting to find out how different greens affect one's play. For example my bowl curved in a completely different way to what does at the Henley Club. It was a really good afternoon - even though our team lost. This year I've probably painted more oil portraits than ever before. This is a recent one of Sir John Madjeski. Not a commission, but I was keen to show the wool texture of his Wembley scarf. 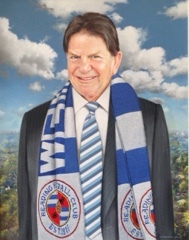 Sir John built the Madjeski Stadium to house Reading Football Club. He is now the co- chairman. This the life-size portrait. 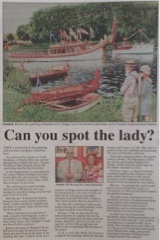 This week's Henley Standard Newspaper contained an article about my recent painting of the Gloriana and the Dunkirk Little Ship - L'Orage. 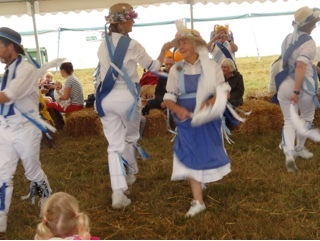 it was very flattering of Lady McAlpine to say "I am completely in awe of his talent. He must be the greatest miniaturist since Nicholas Hilliard...". 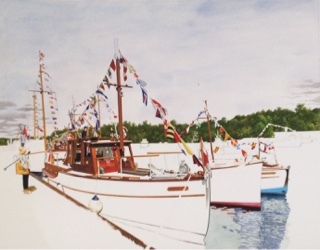 Currently I'm working on another 'boat' painting. 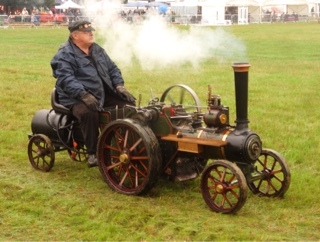 This will eventually show nine Dunkirk Little Ships. The work so far.